Gary McMahon – author of What They Hear in the Dark, as well as Rain Dogs, Pretty Little Dead Things, Dead Bad Things and the Concrete Grove Trilogy. Adam Nevill – author of the critically acclaimed novels Apartment 16 and The Ritual. David Moody – author of Hater, Dog’s Blood and the Autumn series. 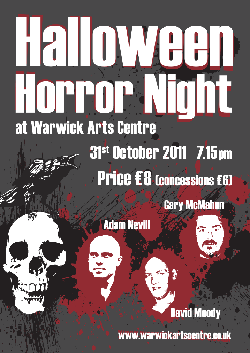 It’ll be hosted by Michael Wilson of Read Horror webzine and takes place at the Warwick Arts Centre in Coventry in the UK on Monday evening, starting at 7.15 – for more information and tickets, go here.